Jim Acosta went to Trump’s rally so he could draw attention to himself and perhaps skew the perception of attendance. The bias media tries so hard not to allow anyone to see all the voters that actually attend these rallies. Acosta actually demanded White House press secretary Sarah Sanders denounce the president’s “enemy of the people” rhetoric about the media. Was he concerned with the “rhetoric” when he and the other journalists emboldened Antifa to assault people? Where was his “let’s be civil ” attitude with Maxine Waters?! Thursday, “Reality Check” Brittany Hughes, gave an accurate description of Acosta’s latest attack on Sarah Sanders. Donald Trump and Barack Obama have appeared on countless magazine covers, but there is a vast difference in how the two presidents have been portrayed. The media has depicted Trump as angry, "lazy," and a "bully," and his predecessor as "cool," "a new hope," and even a superhero. 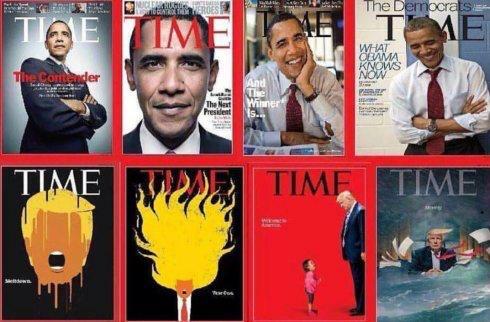 Let’s take a look at some of the Bias Media Covers, but first here is a small look at the achievements (or lack thereof) of Trump and Obama. Only under President Trump has more than 50 percent of Americans believed it is a good time to find a quality job since Gallup began asking the question 17 years ago? The President has secured historic increases in defense funding in order to rebuild our Nation’s military with the resources they need, after years of the harmful sequester. Obama spent his farewell address boasting about his success, but the facts paint a much different picture. The truth is, he oversaw the decline of the American economy, rammed through a disastrous health care law and presided over failed foreign policy. The eight years of hell brought the lowest labor participation rates since the 1970s, with 95 million Americans out of the labor force. The “recovery” has been the weakest one since the 1940s. We have the lowest homeownership rate in 51 years – despite mortgage rates artificially kept at record lows. Over 11 million more Americans on food stamps since he became president and more than 43 million Americans now live in poverty. One of every six men between 18 and 34 are either in prison or out of work. Obama added more to our national debt that all the other presidents before him combined, leaving Office with the national debt at almost $20 trillion. Prior to taking office, the man who has tacked on $9.3 trillion once said the then $9 trillion national debt was “unpatriotic.” There is President Obama's assault on the business community through his burdensome regulations. The estimated cost of regulations under Obama is$873 billion. That includes $344 billion cost in Environmental Protection Agency regulations alone. All in, the number of new regulations finalized under Obama checks in at almost 3,000. Obama brags about how many jobs he's created, but facts do not support his boasting. During his time in Office, America lost more than 300,000 manufacturing jobs and, although Obama doesn’t mention it, America had a global trade deficit of over $732 billion in 2016. ObamaCare, his signature legislation, and crowning achievement. Millions of people lost their doctors and their insurance plans, but that was just the start of the ObamaCare disaster. in 2017, Affordable Care Act premiums exploded by 25 percent on average. In Arizona, they jumped by a stunning 116 percent. Deductibles are so high that even if ObamaCare recipients pay their premiums, they can’t afford to use their coverage in many cases. The average American family saving $2,500 a year on health care, the exact opposite has happened. According to the Kaiser Family Foundation, the increase in health care costs for employer-sponsored benefits since 2008 is now $5,462. That is a 43 percent increase. It gets worse. Choice in health care providers available through ObamaCare is evaporating. In states like Alabama, Alaska, Oklahoma, South Carolina, Wyoming, people buying on the exchanges have a single insurer to choose from. It’s because insurers pulled out after losing massive amounts of money. So much for choice. Foreign Policy: Obama gave Iran, the No. 1 state sponsor of terror, $150 billion and allows them to continue to spin their centrifuges? He paid a ransom for four U.S. citizens Iran held the prisoner, reversing longstanding policy and signaling to the world that there’s money to be made from taking Americans captive. Obama drew a “red line” when he warned Syrian dictator Bashar al-Assad not to use chemical weapons. When Assad crossed it, Obama did nothing. Partly as a result, that country civil war continues and has created a massive worldwide humanitarian crisis. In Egypt, Obama gave Mohammed Morsi, the former Muslim Brotherhood head who became president but is now in prison for murder, F-16s, tanks and $1.5 billion in taxpayer funds. In Libya, the president helped overthrow Qaddafi, and that country has since fallen into chaos, creating a hotbed for ISIS. Speaking of ISIS, back in 2014, Obama called the world’s most dangerous terrorist organization the”JayVee” team. The next year, just hours before the horrific ISIS attack in Paris that killed 130 people, Obama assured us that ISIS was “contained.” ISIS was never a junior varsity team and certainly was not contained. In fact, it seized vast parts of Iraq because Obama created a vacuum when he pulled U.S. troops out too early for purely political reasons. The list of Obama failures doesn’t scratch the surface. He was and remains the worst President we’ve ever had. His objective was to bifurcate and destroy America, and he damned near succeeded. This past election, God granted a stay of execution to the United States with the election of @realDonaldTrump.